If you’ve ever been unexpectedly dive-bombed by a bird, then you know how it feels to read the ending of Allegedly. A fast-moving, flapping blur comes screaming out of nowhere, gets way too close to your face, and then careens out of sight again. Heart pounding, eyes darting, you might illogically wonder for a moment if you hallucinated the whole thing. 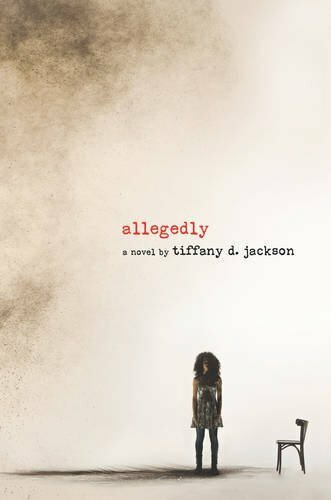 But no, it really happened, you have indeed been the victim of avian intimidation, and yes, Tiffany D. Jackson really did just execute the debut novel equivalent of a mic drop. Mary Addison was nine years old when she killed a baby. Allegedly. She’s never told anyone the story of what happened that night. She’s now fifteen, has transitioned to a group home, and is trying to think about her future. When she finds out she’s pregnant and the social workers tell her she won’t be allowed to keep her baby, she decides it’s time to tell her story. She needs to clear her name so that she and her boyfriend and their child can be a family. And that’s all I’m going to say about the plot, because DUDE you need to experience this for yourself. Bahni Turpin gives the performance of her life in the audio version. It’s on another level. I’ve seen this book compared to Orange is the New Black, and I can see where they’re coming from with the way Turpin brings all the voices of the girls in the group home to life. It’s not a happy place, and there’s a lot of yelling in just about every accent you can imagine. The soft, almost tender way she reads Mary’s words makes the first-person narration even more intimate. I felt like I knew her. The more I think about this book (and I’m thinking about it a lot, it won’t leave my head), the more blown away I am by Jackson’s achievement. She turns what could have been another effective but one-note coming of age story into so much more.